I worked with BBC North West Television on a documentary which told the story of Paulette, who was evacuated to Cheshire with her Guernsey school in June 1940. The school re-opened in a mansion in Knutsford and continued to run as a ‘Guernsey school’ but struggled financially. The school received financial and emotional support from the Foster Parent Plan for War Children where each child was sponsored by a kind American or British person. Many of these sponsors were well known actors or writers. Paulette herself was ‘sponsored’ by an extraordinary transatlantic penpal – Mrs Eleanor Roosevelt, wife of the American President. 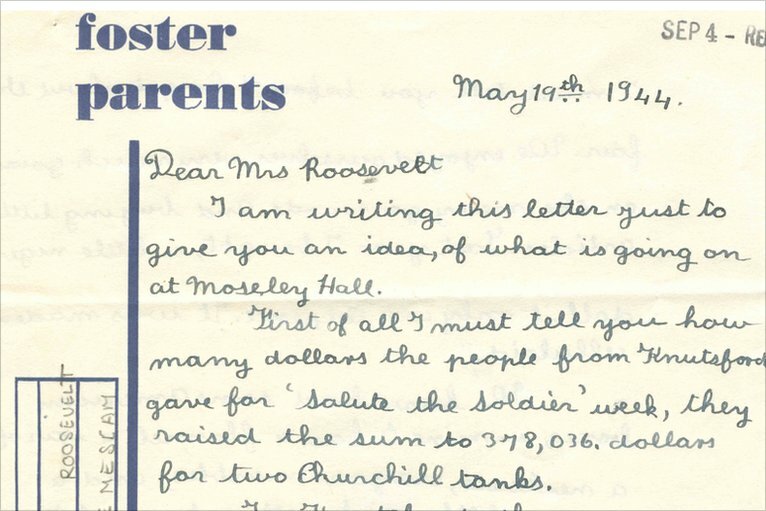 Mrs Roosevelt supported Paulette financially throughout the war and also sent letters and parcels to her. Much of the correspondence between them still exists today. YOU CAN CONTACT ME VIA THE COMMENTS BOX AT THE FOOT OF THIS PAGE. I shall be most interested to learn about Guernsey Evacuees as I was an Evacuee myself from Birmingham. I write about this in my autobiography. I much enjoyed your excellent book. It was a part of the evacuation largely overlooked. It is thorough and authentic. I was impressed the way the local community, taken by surprise, still seemed to be so welcoming. I have focussed on the overseas evacation, specifically to North America, as my brother and I were two who spent five years in the United States during the war. My book on the subject is ‘See You After the Duration’ I was brought up short by one statement in your book: ‘Stockport officials received only a few hour’s notice of the arrival of Channel Island evacuees, yet hundreds of local children had recently been evacuated from Stockport to Canada for safety’. I have never heard of any city from which a hundred let alone hundreds were evacuated overseas. Can you tell me where I can get the information on this.